me! What a beauty. With this and all those new Tokyo Disney rides, Japan trip 2020(s) is gonna be lit. With the Steel Vengeance comparison, it's almost impossible not to compare it. 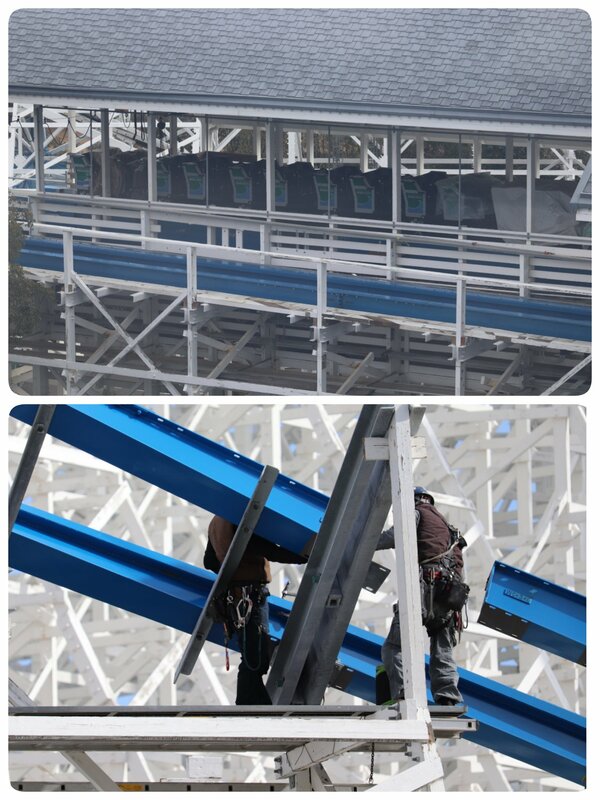 They're both brand new giant RMC monstrosities. Doesn't look quite as good as Steel Vengeance, but the fact they're even comparable is very exciting. some more photos of construction. Coaster Hipster, Slamming Coastercore, Antinos and 7 others like this. I know a lot of comparisons are being made to Steel Vengeance for this I-Box transformation, but I am finding many striking similarities to Outlaw Run for element design and layout appeal - which is a good thing! Outlaw Run, to me, is still one of the best designed RMCs; it introduced many new elements and served as RMC's first opportunity for full design expression, rather than being locked into previous layout designs and needing to adapt. A critique, a minor, hair-splitting critique I have always had for I-Box designs is their conservative nature (or at least, one or two fewer inversions/airtime hills than would have been preferred). RMC is brilliant with their design, no doubt - but the Topper Tracks have always impressed me with their layout and design flow, moreso than I-Box conversions needing to use previous structure. White Cyclone seems to buck this trend however, and strikes me as how RMC would have built the roller coaster from the start, if they could have built from the ground up. theGman, Antinos and Coaster Hipster like this. I believe Schilke touched on that during IAAPA while discussing Twisted Cyclone's layout. RMC's creativity seems to corrolate to the amount of structure they have to work with. Twisted Cyclone only runs two laps because they ran out of structure while designing the ride. Steel Vengeance, on the other hand, had literal mountains of wood to work with, and that enabled a ton of creativity both outside and inside the structure. The second hill best shows this - they could have essentially mirrored Texas Giant's overbanked turn, but they shifted the track along the structure to create that massive airtime hill. Hakugei appears to follow this trend. Why not throw a stall, an outside banked turn, and a 0-g roll all in series? They have the structure to do it. Ethan, Luca B, CrashCoaster and 2 others like this. RMC's creativity seems to corrolate to the amount of structure they have to work with. One would think that but Twisted Cyclone was outstanding. Looking at the overall package, it's relatively standard for an RMC - there's one exotic element that's been implemented on multiple rides of there's. But despite that, they executed the ride extremely well. Robin Hood/Untamed would likely go the same way...but time will tell. Trains are here! They are the Gen 1/Legacy trains. And the ride is looking awesome! I don't know why people are saying this looks drawn out, it looks to be one of the best RMCs IMO. EpochEmu, peep, Peet and 3 others like this. How many trains do people think this will run? I mean it doesn't have a MCBR so two would seem the likely option, but the coaster is huge and it has two maintenance bays, so I could see it running three. But either way, it's kinda nice that this doesn't have a MCBR. Even if it had MCBR I doubt it would ever run 3 trains anyway. Nagashima Spaland's operations (along with the rest of Japan, excepte for Disney and to some extent Universal) are not great. But the thing is; does it matter if it's not as insane as Steel Vengeance? I'm sure it'll still be world-class, as it seems like even the weakest RMC is rated more highly than 90% of coasters! Besides, the Japanese audience who will be riding this coaster most likely won't have ridden or even heard of Steel Vengeance unless they're a coaster enthusiast, so I'm sure they'll love Hakugei to bits! If you think of this ride compared to what else Asia has like it, then I'm sure it will be a world-class ride for Nagashima! I still think enthusiasts will keep asking "But is it as good as Steel Vengeance?" especially around opening. I forgot about the lack of MCBR though, should flow nicely. Of course they will. Let's be honest, we've been saying that with every new creation from RMC over the last decade. I personally feel this will be a very good ride with a very unique layout. I'll try to do what I do with all new coasters and go in objectively. 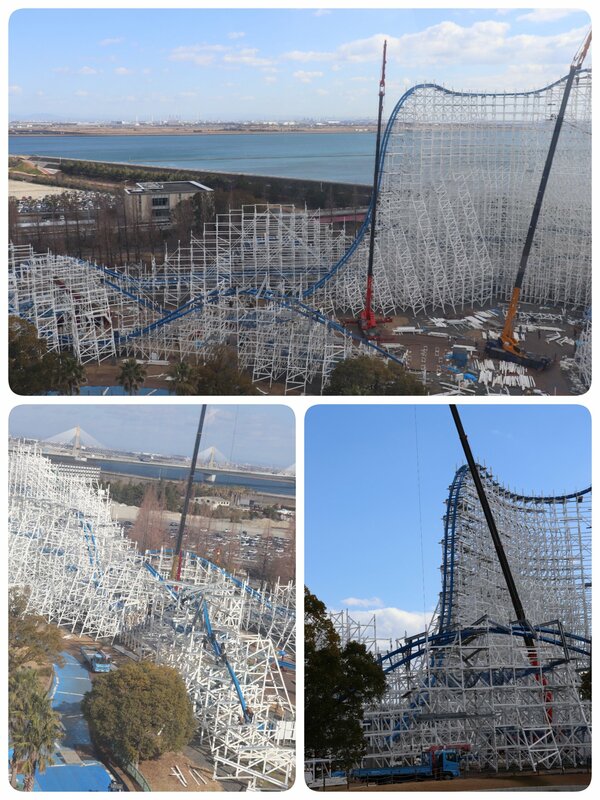 The good news is that this is in Japan, even if it's at Nagashima, we won't see TOO much press so it should be easy. Yunho Kim, FarleyFlavors, vaugc002 and 8 others like this. Antinos and Lofty like this. It just keeps getting prettier. I can see elements being possible from multiple angles. Can't wait to HOPEFULLY ride this in 2020! I had it in my head that this was a 2020 addition, not this year. @CoasterMac305 made a recreation/prediction layout based on what we've seen so far. Still great stuff imo! b&mfanboy123, Matt N, Pear and 1 other person like this. Looks really fun, but definitely not a full use of potential. Thanks for the video @CoasterMac305!